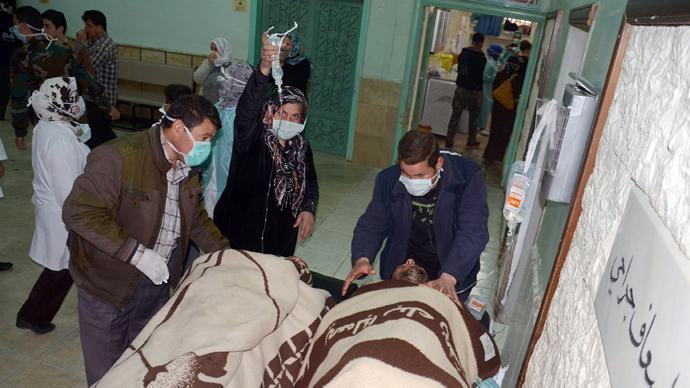 The West should refrain from using “unconfirmed reports” of chemical weapons use as political leverage in Syria. You either have evidence or you don’t, British Labour Party MP Jeremy Corbyn told RT. Moscow now appears to have conclusive evidence that it is the rebels who are guilty of the March chemical attack in Aleppo which killed dozens of Syrians. This comes as the United States continues to put the blame on the Assad government. However, Corbyn says that any such proof may not bring the Syrian conflict any closer to a resolution. RT:Do you think the evidence that the Syrian rebels used sarin gas could in any way impact the British stance in Syria? Is it going to be affected by what we are hearing is strong evidence? Jeremy Corbyn: It seems very strong evidence indeed; I saw the interview with the Russian officials this morning describing the use of sarin gas. Let’s get it on the table first of all that any use of chemical or biological weapons by anybody – be it the opposition or the regime – is simply wrong, it’s illegal within the 1925 Geneva Convention and any decent sense of humanity. Secondly, the effect in Britain is considerable, because the government a few weeks ago was saying they want to end the European arms embargo on Syria and resume arms deliveries to Syria in August, jointly with the French, has now been put on a degree of hold. And a vote was due to be held in British Parliament requiring the British government to bring their plans to the Parliament first and vote on it. The Foreign Secretary William Hague announced today that there will be no delivery of arms without the specific and stated approval of the British Parliament. There is a lot of opposition to British arms supplies going to the Syrian opposition, both within the ruling Conservative party. A considerable number of Liberal Democrats are in coalition with the Conservatives and the leadership and front bench of the parliamentary Labour Party is also opposed, so it’s very hard to see how there would be parliamentary approval anyway. People have memories of Libya, Mali, Iraq and Afghanistan, and there is a lot of concern about getting involved in another war. RT:Today, Moscow says it has evidence that rebels have used sarin gas. Earlier Britain said that Assad forces were behind the chemical attack. But why didn’t Britain and the US come forward with the same sort of hard evidence that Russia has come forward with? JC: That’s an interesting question. I can’t speak for the British or the US governments, but they made these allegations about the use of chemical weapons – and there are apparently stocks of chemical weapons being held in Syria, which may well have fallen into opposition hands, or may still be in government hands, or maybe both – but the assertion was made that they had been used. But no hard evidence came up, and indeed, there was a great deal of skepticism surrounding the evidence that was never presented. And the Russian evidence today appears much stronger, and they said they were going to put that evidence in the hands of the United Nations - that has got to be a good thing. However, proving or not proving this doesn’t end the crisis, there has to be the rapid resumption of talks by Geneva too, all parties must be involved – including Iran. If we’re to bring about a settlement, there’s got to be involvement of Iran, as well as all the different parties in Syria. RT:After the hard evidence that Russia has put forward, do you think we will be seeing hard evidence any time soon from Britain or the US? JC: If they have it, they’ve got to bring it forward. If they haven’t got it, then they should not say there are “unconfirmed reports.” The reports are either confirmed and the evidence is there – or they are not. I think we should be quite clear about that. And anyone who has any evidence should hand it over straight to the UN. But I go back to the point that proving it one way or another doesn’t solve the issue. The issue must be solved politically. That’s where Geneva too must come in.